Hotel del Coronado is a beachfront luxury hotel in the city of Coronado, just across the San Diego Bay from San Diego, California. It is one of the few surviving examples of an American architectural genre: the wooden Victorian beach resort. It is one of the oldest and largest all-wooden buildings in California and was designated a National Historic Landmark in 1977, and is a designated California Historical Landmark. When it opened in 1888, it was the largest resort hotel in the world and the first to use electrical lighting. 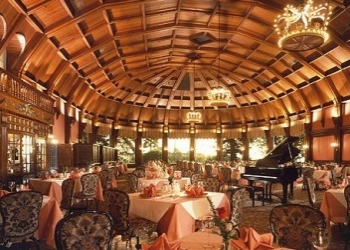 It has hosted presidents, royalty, and celebrities throughout the years. The hotel has been featured in numerous movies and books. The elegant Hotel Del Coronado was opened in 1888 and soon became a favored destination for people from all over the world. It is not long after the Hotel's opening that our ghost story starts. Tom and Kate Morgan were a married couple who rode the trains in the late 1800s. Their occupation: con artists. Kate was apparently very attractive, and would lure men into a game of cards with her "brother" (Tom), so that they could prove their worth. Tom would swindle them out of whatever money they were willing to part with, and this is how the Morgans made their living. In November of 1892, however, Kate discovered she was pregnant and wanted to stop the train racket and settle down. While the two were riding towards San Diego, they had an argument because Tom did not want to change his lifestyle. Tom disembarked at either Los Angeles or Orange County. He was supposed to meet Kate in San Diego for Thanksgiving. 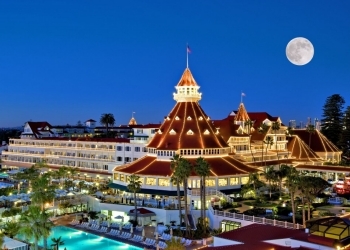 Kate continued on to San Diego and checked into the Hotel Del Coronado under the name "Lottie Anderson Bernard". There she waited for Tom, but Thanksgiving came and went with no sign of him. She checked other hotels in the area but could not find him anywhere. During this time, Kate complained to various staff members of feeling ill and reports of the time indicate that she was looking pale. It is suspected that she performed an abortion on herself. It is known that while Kate was waiting for her missing husband, she ventured into San Diego and bought a gun. It was shortly after this that Kate was found shot in the head on some steps leading down to the beach, an apparent suicide. 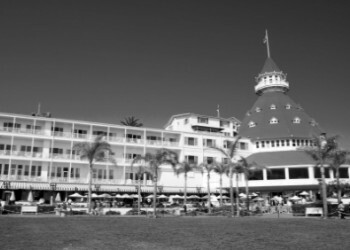 For years everyone accepted that the death was a suicide, until 1990, when Alan May,a lawyer who specializes in murder cases, published the book The Legend of Kate Morgan: The Search for the Ghost of the Hotel del Coronado. May pored through old records from the time of Kate's death. He came to the eventual conclusion that Kate did not kill herself, but was murdered by her husband. There are several pieces of evidence supporting this theory, the most compelling of which is the fact that the bullet in Kate's head was of a different caliber than the ones in the gun she bought. Also, the position her body was found in was not consistent with a suicide. The room Kate checked into was 302, which is now room 3312. But that is not the only haunted room. Room 3502, which was once a maid's room, is also considered haunted. Both rooms have experienced oddly functioning electrical equipment and cold breezes. Maids report that objects are moved around by unseen hands. Guests in the rooms have experienced oppressive feelings and curtains that move even though the windows are closed. Other people swear they have heard murmurings coming from somewhere in the room. Kate's ghost has been seen walking down hallways of the hotel and standing at windows. According to Alan May, an electrician told him that the light over the steps where Kate died will not stay lit. The bulb is replaced constantly, but the light always winks out. May also claims that while he was staying in one of the haunted rooms, he saw a face on the television. This sighting was supposedly verified by one or two hotel employees. Room 3502 has a history of its own. Apparently, the maid who was living there during Kate's stay may have become friends with Kate. What is known is that the day after Kate's funeral, the maid disappeared. There is some speculation that Tom Morgan may have killed the maid as well as his wife. One story even theorizes that when hotel staff found the maid's body, they surreptitiously removed it so as not to further upset the guests!